We’d love your help. Let us know what’s wrong with this preview of The Dragon Grammar Book by Diane Mae Robinson. 2018 Four-Time Gold Medal Winning Book in Children's Education. The Dragon Grammar Book is the perfect grammar study guide to help readers learn the rules of grammar and improve language art skil 2018 Four-Time Gold Medal Winning Book in Children's Education. The Dragon Grammar Book is the perfect grammar study guide to help readers learn the rules of grammar and improve language art skills with ease and enjoyment. 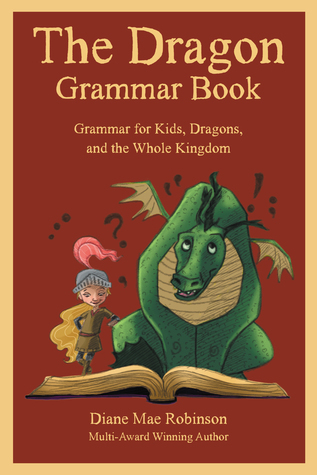 From multi-award-winning children's fantasy author, Diane Mae Robinson, The Dragon Grammar Book provides a fun and engaging approach to learning English grammar through easy-to-follow lessons, humorous example sentences, and chapter quizzes to conquer all those tricky grammar rules. - Easy-To-Understand Lessons organized to gradually build on the basic grammar rules toward an intermediate level. - Engaging Examples Sentences explain each grammar rule through a humorous and creative writing style. - An Expansive Resource of grammar terminology, confusing words, punctuation rules, types of sentences and proper structure, parts of speech, verb agreement, and more. - Quizzes with Answer Keys reinforce each lesson before proceeding to the next lesson. Featuring the zany fantasy characters in the author's international-award-winning The Pen Pieyu Adventures series, The Dragon Grammar Book is sure to be enjoyed by kids, teens, young adults, and the whole kingdom. "Oriented toward pragmatic, real-world usage,The Dragon Grammar Book is a great resource for kids, their teachers, and anyone else who'd like to know more about language and how to use it. Most highly recommended." --Jack Magnus for Readers' Favorite. "With clear examples and fun activities, this book is a must-have for readers and aspiring writers." "Having a useful resource that engages students and includes a wide variety of grammar rules with short, fun examples is difficult to find. Robinson has produced a winner with this easy-to-navigate, all-inclusive, grammar book for kids." "I've rarely come across as well presented and entertaining an approach to what can be an intimidating subject, particularly for a young audience or for adults learning English as a second language. Robinson gets to the heart of the really puzzling aspects of grammar and offers them up in a format designed to make learning grammar more fun." "As a homeschool mom, I love using this book to teach my kids homeschool grammar because it is fun and engaging and helps them actually understand grammar while having fun! " To ask other readers questions about The Dragon Grammar Book, please sign up. The pr The Dragon Grammar Book is a wonderfully written and beautifully organized must have writing companion for children and adults alike. The book takes a very, very dull subject and jazzes it up so it becomes enjoyable for child I loved this book. It now sits in a prominent place in my office. Grammar, for me, was always infinitely boring and difficult to understand – something to be avoided like the plague. But, under the tutelage of Ms. Robinson, it has come alive! Not only does she describe and explain adjectives, adverbs, compound sentences, etc., etc., but she does so with humor and a bit of whimsy which delights the reader. I recommend this book for all writers, irrespective of age. Five big shiny stars for this break-through reference manual! The fact that the author has gone to the trouble of creating crystal clear OOPS crystal-clear and fun examples of all the grammar rules any one OOPS anyone needs to know makes the book useful to those who hated grammar in school to the point they still don’t know wh It occurred to me while reading through Diane Mae Robinson’s The Dragon Grammar Book that its OOPS it’s not a work only for OOPS for only young visitors to her delightful kingdom. It’s for of all ages who want to communicate clearly. I especially love the twist Ms. Robinson puts on the lessons, putting us in a setting of magic, knights, and dragons, which is fun. Kids of all ages will love this! The Dragon Grammar Book: Grammar for Kids, Dragons, and the Whole Kingdom by Diane Mae Robinson is a what it says it is, a textbook for grammar. This book covers all the basics about grammar describing things like Adjective, Adverb, Nouns, Contractions and so on. While discussing the complex English language and how to use it, Diane Robinson tries to bring the explanations down to a level kids can understand. To keep it interesting there is a story line from one chapter to the next involving Sir The Dragon Grammar Book: Grammar for Kids, Dragons, and the Whole Kingdom by Diane Mae Robinson is a what it says it is, a textbook for grammar. This book covers all the basics about grammar describing things like Adjective, Adverb, Nouns, Contractions and so on. While discussing the complex English language and how to use it, Diane Robinson tries to bring the explanations down to a level kids can understand. To keep it interesting there is a story line from one chapter to the next involving Sir Princess Petra and the dragon Snarls dealing with magic, farts, and other mischief. Together they help kids, and adults, grasp the often challenging concepts, as well as, being able to laugh while they learn. Coming from a background of having a BA in English, and having homeschooled my children, I could see the value in this book. This is not meant to be read cover to cover like a novel, rather it is a textbook. Having kids in the middle school range I can see this would be a great resource for the fifth to seventh grade level. The explanations are short and concise followed up by humor examples that will appeal to boys and girls in this age range. As a parent and home educator I appreciate the thoroughness of the explanations and how it lays out the chapters in a logical format where they all flow from one concept to the next, keeping not only the story line cohesive, but the lessons build on each other. Additionally, I like the review that is included at the end of each chapter. This allows for the student to test their knowledge and reinforce what they learned. The quizzes are short and effective, allowing the teacher to see that they get the idea but not being so overwhelming with just busy work. There are also two levels of tests at the end of the book that make a good end of year review. Overall this book is a fun way to introduce grammar to kids, there are fun illustrations that go along with the storyline. The chapters are short and provide review material. This is a great resource for families that are home educating, but also for those with children in school. Since the sections are so short it makes for a great review source to supplement their regular school work and to use a reference guide. The humor is right on a child’s level, so they can grasp the concepts without being bord. I would recommend this book to anyone that struggles with grammar, or with helping their kids learn grammar. The only change I would make to this book is to make a supplement, or appendix with the quiz questions separate from the main chapter without the answers readily available to see. It would be nice to have the ability to print or copy each sections quiz and the skills test on their own. Overall a great resource for learners of all ages. Canadian author Diane Mae Robinson freely states `My mission in life is to inspire children to believe in the magic within themselves, to become heroes, and to accomplish great things' and to that end she is proceeding with her series of richly detailed imaginative fantasies focusing on a young princess who feels the need to be a knight - thus the perhaps confusing title of Sir Princess Petra. Diane earned her journalism diploma from the Schools of Montreal and an advanced diploma from the Institute of Children's Literature in Connecticut. She also teaches art and writing in addition to her own primary interest of writing her own novels. Though young and new to the field of publishing she has already been awarded honors and medals. Her books to date - SIR PRINCESS PETRA (3 novels in the PEN PIIEYU ADVENTURE Series), THE FOREST PAINTER each belonging to young adult fantasies. While this book is visually one that young learners will enjoy, adults (and young adults) will find the information more useful that school textbooks. The figures from her previous books keep it light but make no mistake; THIS is a fine grammar lesson! Diane’s thirteen awards earned for her other books will soon be matched by all manner of awards for this very fine teaching tool. Who doesn't love a challenge? I love the way this book makes it simple for children and adults to learn, review and refresh the rules of the English language. The author uses a chapter book approach to highlight parts of speech, sentence structure, modifiers, word agreement, punctuation, and confusing words. Robinson strives to leave no stone unturned. She even tackles ellipsis, brackets, braces, quotation marks, and em and en hyphens, which most readers of this book probably never knew existed. I received an ARC of this book from the author and voluntarily chose to read and review with my honest opinions for no monetary compensation. Ms. Robinson explains in a clever and engaging manner, so that young writers can better understand the complex rules of English grammar. The entire family—or Kingdom—will enjoy the examples and activities from her award-winning series offered within the book. The illustrations that begin each chapter help set the playful tone. Covering everything from punctuation to clauses to tricky word pairs and even more, this is a comprehensive glance at basic grammar. . .with a lovely dose of dragon, that is. After several pages of explanations concerning grammar terminology, the book goes on with ten chapters concerning various themes. Then, there are two fun tests at the end (as well as answers) to h This is a small treasure chest of grammar information, not only for kids but also for adults and those who love visiting dragons. Before learning about something, you must know about the words that you might come across. That will save you the trouble of wondering what a word means every few lines. It will keep you from breaking the flow to consult a dictionary. To abate that problem, Diane Mae Robinson has opened her book with a glossary of common words used in grammar. Words like adjectives and verbs. This gives the reader a strong foundation before they delve deeper into the nitty gritties of grammar. The Dragon Grammar book then goes a step further and tells you what not to do. If you are trying to find directions to get somewhere, you want to know which turn not to take. Think of this second section as the forbidden path. It constitutes words that are commonly misused. It shows the reader how to use the said words in adherence to grammar rules. They are just common words like- there, their, they’re. Once the foundation has been properly developed. It is time to get into the think of it. The rest of the book is about word usage and sentence structure. This is where you earn your chops as an English speaker. All the basics and some parts of intermediate level grammar are highlighted and explored. The author has done an incredible job of including props. You always remember better when there is a picture accompanying the words. She develops that picture by involving characters from her The Pen Pieyu Adventures. Integration of these characters into The Grammar Book is simply genius. It is the perfect recipe for turning this from a frumpy textbook into a fun reading material and experience. In a further attempt to ensure the resource is not your run of the mill roadmap, she includes very funky examples. She also has quizzes at the end of each chapter. How does it feel when you finish reading a chapter then pass the ensuing quiz with flying colors? You proceed to the next, right? Moreover, your knowledge pool increases in depth, right? This is what these quizzes do. They ensure that the lessons remain ingrained. The book’s format contributes to the reader’s intake of the material. It takes the subject matter one meticulously precise step at a time. Each topic is designed to explore an individual grammar rule. The author has presented this book very well for maximum consumption of the benefit. It is useful and engaging. It provides a quintessential view of the subject in a simple way. It is dubbed ‘Grammar for Kids’ but from close review of the material it could be well and appropriately applicable to all ages. Children will enjoy the book’s deviation from a textbook approach and will therefore be more receptive to it. Learning never stops and adults can use this guide for reference. If English is not your first language, worry not. This book is designed to help people to whom English is completely and utterly foreign. The Dragon Grammar Book: Grammar for Kids gets five stars out of five for being useful, informative, and entertaining. To keep the book from feeling too much like a formal grammar book, each chapter begins with happy, light-hearted drawings of the characters from The Pen Pieyu The Dragon Grammar Book by Diane Mae Robinson is a clearly written, informative book of grammar for anyone ages 12 and up. It begins with an explanation of the author’s purpose for this project and a list of important definitions that should help readers understand the grammar and punctuation rules that are well-organized into ten chapters. To keep the book from feeling too much like a formal grammar book, each chapter begins with happy, light-hearted drawings of the characters from The Pen Pieyu Adventures series written by the same author. When they are compared with each other, the characters in the pictures seem to tell a fun story of their own about how grammar and punctuation might seem frightening at first but can be studied and learned. With an easy to understand book like this one, anyone can forget about it being a boring subject, and they can get excited about finally understanding how grammar and punctuation rules work. The Dragon Grammar Book is a handy book to have around! In this book, the rules are explained very well, and they have simple, sometimes silly, sample sentences about a kingdom with dragons in it. Most of the sentences show readers how to set up grammar and punctuation correctly, but in a few of the sections, sentences are labeled with (Wrong). This helps readers see common mistakes that anyone can make. The “Test Your Knowledge” sections and two tests also give readers opportunities to check how much they learned from the book. Much of each test comes from the sample sentences, so readers can review explanations in the chapters again if they can’t quite remember how to set up the sentences. The book ends with a few character sketches and positive feedback from others about the author’s Pen Pieyu series, so if readers enjoyed the theme in this book, they might decide to read those books too. Grammar is usually hard to understand, but Ms. Robinson has made a difficult subject easy and interesting to learn. She explains why correct sentences are set up exactly the way they are, how some of the sentences are written incorrectly, and what to do to fix the mistake. When I first started studying grammar, I didn’t like it because many of the rules were complicated and didn’t make sense to me. This book has cleared up most of my confusion and has helped me see the purpose of learning to follow grammar and punctuation rules properly. I think reading this book will even help me be a better writer because it has helped me understand more about the parts of speech and how they work together with punctuation. Now I can set up my own sentences correctly more often and make sure they express the exact meaning that I want. English is a first language across the world, while it’s a second language to many others, there can be plenty ways to get your point across but it’s all about comprehension. For everyone who had the opportunity to go to school from kindergarten through at least high school, we were taught how to use proper grammar when conveying our thoughts. Over the years, we slowly forget grammar rules and just incorporate filler words when communicating with others, even though it’s not the best practice. I English is a first language across the world, while it’s a second language to many others, there can be plenty ways to get your point across but it’s all about comprehension. For everyone who had the opportunity to go to school from kindergarten through at least high school, we were taught how to use proper grammar when conveying our thoughts. Over the years, we slowly forget grammar rules and just incorporate filler words when communicating with others, even though it’s not the best practice. 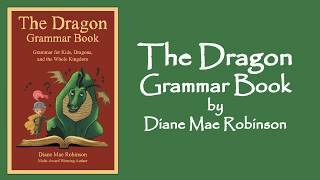 In “The Dragon Grammar Book”, author Diane Mae Robinson is teaching her readers the general usage and rules of grammar. There were so many things mentioned that I honestly don’t remember ever learning in school. Everything she talked about while incorporating examples helped to demonstrate why words are to be used properly. Although most examples are provided for a better understanding, she also states in a few instances that journalists and writers no longer use certain grammar rules because they’re dated. I enjoyed adding mini stories about dragons when giving examples of how these grammar rules are used. This makes it more of a two-in-book book, you’re reading tidbits of a possible story about dragons while learning tips on proper grammar use. It might seem like a book for children based on the designed cover, but everyone of all ages can use this as a helpful resource, I know I would. By using this as a grammar guide for my future writing, I can make life-altering improvements on how I convey my thoughts and get better in grammar. The illustrations included by Breadcrumbs Ink gave the book a child-friendly feel to reading this. Both teachers and parents can teach children of all ages all about grammar using only this book. All words described are first defined, explained how it is used, and then provided as an example. I’m a huge fan of learning by example because it shows if they can do it, so can you. It’s an enlightening reading experience as it can be used as a refresher when forgetting some appropriate uses of English grammar. This book was well-written and you can tell how much time the author took to make her explanations as comprehensible as possible. Short little tests are located at the end of each chapter to practice your new-found knowledge, and answers to check how well you did. Even if you didn’t get every test question correctly, you have the opportunity to review the chapters again for reference. Diane May Robinson's The Dragon Grammar Book is a concise text of English grammar presented using examples relating to imagery typical of children's fantasy literature. It begins with a quick overview of grammar terms before going on to describe rules in more detail. Each chapter introduces a different type of common grammar rule or mistake and provides concrete examples of the various usages. At the end of the book there's a practice section where you can test out your newly learned/refreshed s Diane May Robinson's The Dragon Grammar Book is a concise text of English grammar presented using examples relating to imagery typical of children's fantasy literature. It begins with a quick overview of grammar terms before going on to describe rules in more detail. Each chapter introduces a different type of common grammar rule or mistake and provides concrete examples of the various usages. At the end of the book there's a practice section where you can test out your newly learned/refreshed skills. Despite the whimsical nature of its title, this book is not only for young ladies and knights in training, but can also prove useful for even the most seasoned of wizards. Though it presents everything in a way that's easy to understand, it doesn't skimp on topics that might get overlooked in grade school, such as em- and en-dashes. That being said, I wouldn't necessarily recommend this as a young child's first dip into grammar rules as some of the explanations and terminology are a bit advanced. However, for the young learner who has encountered these concepts in school before, this is a fantastic resource to help them refresh and commit these rules to memory. While the refreshingly simple explanations are definitely a drawing point, the real star of this book is the consistency of the theme. Robinson uses dragons and princesses not only in her examples, but also in the explanations themselves. Let's be real here, to most people, even those of us who write for a living, reading about grammar is just about as dull of a pursuit as you can get. Reading through this particular grammar book, however, I found myself smiling, compelled to continue simply for the enjoyment of it all. I was also thrilled to see that Robinson practices what she preaches. Just as she encourages writers to eschew rigid grammar rules for the sake of "grace," she ignores standard fantasy tropes to make her examples more appropriate for modern readers with examples such as, "The princess is to be knighted." At first glance you could be forgiven for thinking, 'The Dragon Grammar Book: Grammar for Kids, Dragons, and the Whole Kingdom' is solely aimed at school children, however, the clue, as to the age of the intended audience, is in the second part of the title. The author, Diane Mae Robinson, will delight and entertain children with her tales of princesses, dragons & knights whilst becoming more informed about the nuances of the English language. However, I would al Don't be Fooled by the Cover! Creatively substantive. Amusing and valuable. When I was in grade school and loving English, learning the parts of speech was one of my favorite assignments. I knew every clause and contraction by heart and just aced every test on the subject. As the years went by, like most of us, the rules and terminologies of grammar were buried in my subconscious and I wrote, edited and spoke correctly - or incorrectly - without being able to exactly explain why. Along came Diane Mae Robinson’s wonderfully cr Creatively substantive. Amusing and valuable. Along came Diane Mae Robinson’s wonderfully crafted Dragon Grammar Book providing a one-stop resource for old “kids” like me who need a refresher course. Surely, I remembered the difference between awhile and a while? And how about when to use who, whom, whoever and whomever? What about lie, lay, lain - past, present and past participle? Golly. Okay, at least I now know for sure it is never all right to use alright without having to Google it. Kids will enjoy learning grammar especially if they have read Robinson’s charming Sir Princess Petra books. But even if they have not, they will be entertained as well as informed by rules and principles that are wrapped in the fictional references to her books, giving the grammar lessons a storybook quality. Spoiler alert! There will be tests. I’m not telling if I aced them all. If you have ever had trouble with proper English and grammar, then this book is for you. It may look like it was written for school age children, but looks are deceiving. True, it was written in a style and format for a child to easily learn from, but adults will find it interesting also. I did. I even enjoyed the pictures throughout the book. Although it has been many, many years, I remember learning everything that was touched on in this book. Even back then, I had problems remembering some of If you have ever had trouble with proper English and grammar, then this book is for you. It may look like it was written for school age children, but looks are deceiving. True, it was written in a style and format for a child to easily learn from, but adults will find it interesting also. I did. I even enjoyed the pictures throughout the book. Although it has been many, many years, I remember learning everything that was touched on in this book. Even back then, I had problems remembering some of the rules, as there are so many that were confusing or contradicting. This gave me a refresher course. It is a pet peeve of mine to see people using the wrong spelling of words, such as: there, their, they’re, or to, two, too. To me, that’s the easiest part of grammar. My confusion is in other areas, like who or whom; and lie, lay and lain. I liked taking the tests at the end of each chapter, and at the end of the book. I would like to say that I answered everything correctly, but alas, no. I will be keeping this as a reference book to refer to when needed. As a junior high and high school teacher, I really appreciated the organized and gradual way the author sets forth the teaching methods in this book. The book starts with grammar terminology so the reader can easily flip back to this section when they need a refresher on the terms. The next section--Confusing Words--is a breath of fresh air to any teacher or writer. Then with each subsequent easy-to-follow chapter, the author builds on the previous chapters to gradually go more into depth on mor As a junior high and high school teacher, I really appreciated the organized and gradual way the author sets forth the teaching methods in this book. The book starts with grammar terminology so the reader can easily flip back to this section when they need a refresher on the terms. The next section--Confusing Words--is a breath of fresh air to any teacher or writer. Then with each subsequent easy-to-follow chapter, the author builds on the previous chapters to gradually go more into depth on more complicated grammar rules. What an amazing book! Diane Mae Robinson has taken the complexities of grammar and made them as easy as possible. Although she uses the characters of The Pen Pieyu Adventures series, this grammar book is a great resource for adults as well as children. In fact, there are a couple things listed that I often have to look up when I'm proofreading. I tagged those chapters and will I chose to read this book after receiving a free e-copy. All opinions in this review are my own and completely unbiased. What an amazing book! Diane Mae Robinson has taken the complexities of grammar and made them as easy as possible. Although she uses the characters of The Pen Pieyu Adventures series, this grammar book is a great resource for adults as well as children. In fact, there are a couple things listed that I often have to look up when I'm proofreading. I tagged those chapters and will keep them as a reference. Petra and Snarls are back for more in the Pen Pieyu Adventures. This time, they are tackling something fun and incredibly challenging: grammar. Join them and the rest of human and dragon kind in a quest to discover the secrets of words: their usage, spelling, and which punctuation goes with them. Written in second person, this book instructs you of the dos and don'ts of grammar and the English language. With exciting examples to engage readers, you won’t want to miss out of this enjoyable, easy Petra and Snarls are back for more in the Pen Pieyu Adventures. This time, they are tackling something fun and incredibly challenging: grammar. Join them and the rest of human and dragon kind in a quest to discover the secrets of words: their usage, spelling, and which punctuation goes with them. Written in second person, this book instructs you of the dos and don'ts of grammar and the English language. With exciting examples to engage readers, you won’t want to miss out of this enjoyable, easy-to-understand, educational book. The Dragon Grammar Book was an easy-to-read informative book that I thoroughly enjoyed. Though this book was about grammar, which is not my favorite subject in school, the author, Diane Mae Robinson, did keep me engaged most of the time. It's meant to be a reference book on grammar, not a story to be read in one sitting. After reading the Pen Pieyu series, I fell in love with Petra and Snarls. Their unique personalities were portrayed perfectly and just as I remembered them. That was enough to keep me smiling throughout this entire book. It was an enjoyable book that kept me entertained. The facts in this book were spot on, and I learned a lot about grammar, spelling, and punctuation rules. As an educational book to look up some quick English facts, this is perfect. And I must say that after studying this book, I’m absolutely positive I’ll ace my next grammar test. Any elementary or middle schooler who reads this will, too. Who knew an English grammar book could be so fun? I am always looking for fun ways to teach Diane Robinson not only gives comprehensive explanation of parts of speech, but also common punctuation rules, with entertaining examples and illustrations. She also includes examples of commonly misused grammar and the correct way it can be used in a sentence, she also does this with the punctuation. This was a fun refresher and I will be looking to get her more of her books in hard copy for my children. Who knew an English grammar book could be so fun? I am always looking for fun ways to teach my children, because if it is interesting they will remember it longer and want to learn. I always got a room full of chuckles when I mentioned dangling participles. The Dragon Grammar Book gives me great material that I can use as an example while keeping a straight face. It's well or A long time ago in a galaxy far away... Well, back in the 80's in the country of Greece anyways, I was an English teacher and taught English as a foreign language to ages ranging from grade school to adults. To make a long story short I could have used a book like this one to make my job easier. An excellent new concept to learning grammar. Originally, I thought the book was for children but it's actually for about grade 6 all the way through to adults. Everybody will learn grammar in an easy and fun way. The illustrations make the book all the more fun. As a homeschool mom, we have been using this in our lessons, it has been such a great way to teach my daughter about grammar in a fun and exciting way. Between the illustrations and fun example sentences and even skill tests! Such a great way to learn grammar. Excellent for all ages. Bought for a family member. Kept it. The Dragon Grammar Book: Grammar for Kids, Dragons, and the Whole Kingdom provides a thorough overview and lesson in English grammar. Author Diane Mae Robinson covers the basics of grammar in a way that is interesting and imaginative. Who would of thought that dragons would have a place in the teaching of grammar? They do, and Robinson uses them to add creative examples and a silly storyline to her book. The organization of the book is definitely its greatest strength. The book starts off with ba The Dragon Grammar Book: Grammar for Kids, Dragons, and the Whole Kingdom provides a thorough overview and lesson in English grammar. Author Diane Mae Robinson covers the basics of grammar in a way that is interesting and imaginative. Who would of thought that dragons would have a place in the teaching of grammar? They do, and Robinson uses them to add creative examples and a silly storyline to her book. The organization of the book is definitely its greatest strength. The book starts off with basic grammar terminology, providing in-depth definitions and examples of terms, such as adjective, adverbs, contraction, etc. I particularly liked this method of starting off with the terminology because if the reader is not an English teacher or student studying English, then he or she most likely isn’t familiar with the basic grammar terms. Even if you’ve learned grammar in school, which I’m sure we all have, it’s likely that you have forgotten exactly what each term means and how it helps comprise a sentence. Having this terminology as one of the first things in the novel gives the reader a basic foundation to understand the content of the rest of the chapters, and it also serves as a reference guide for the reader to look back on if needed. Next in the novel are the actual chapters, each one focusing on a component of grammar, and each using the characters from The Pen Pieyu Adventures to provide examples along the way. The use of this very specific theme makes the book a lot more interesting to follow and read. Someone who is interested in learning grammar or has even been forced to learn grammar would most likely reach for this book over the basic grammar textbook. Also, something noteworthy about the chapters in the book are that they include quizzes at the end to help test the reader’s knowledge of the content just covered. There are also two tests and answers to the tests at the very end of the book. The simple set up of the book as well as the quizzes and tests work well to present the information in a simple and informative manner as well as ensure that the reader understands the information and lessons that are being presented. Even though the book’s imaginative theme is what makes it interesting, it can also be seen as a small weakness. The actual content of the book can pretty much be used by anyone that is required to learn the basics of grammar or anyone who is just wanting to brush up on their grammar. However, the dragon theme to the book likely only makes it targetable to a younger audience. To clarify, this book could be useful in an elementary or even middle school classroom, but it would not be taken as seriously within a high school or college classroom.